21-Sep-2003 -- I, Joseph Kerski, Geographer from the US Geological Survey in Colorado USA, and David Litke, USGS hydrologist, visited Latitude 37 degrees North, Longitude 122 degrees West on the last Sunday of summer in the beautiful western hills of California. As David and I had just finished setting up the computer lab for a Geographic Information Systems (GIS) class at the USGS Western Geographic Science Center in Menlo Park, a confluence visit seemed like an appropriate way to begin a week of collecting and analyzing geographical information. We departed the USGS science center at 3:45pm local time, driving southeast on US 101 to California Highway 85, southeast to California 17 on the outskirts of San Jose. Highway 17 winds south over the coastal range, affording interesting views of the varied California terrain and vegetation. As most people were returning from a Sunday at the beach and driving north, we were able to reach Highway 1 in Santa Cruz by 4:50pm. We drove north up the steep hillslope to DeLaveaga Golf Course and parked across from the clubhouse. The surroundings were magnificent, the greens, trees, and bushes all lit by a bright, sinking California sun. Quite a few golfers and hikers were in the vicinity enjoying the last of the weekend. The temperature was nearly 34 degrees C with almost no wind. After walking to the 10th fairway, we paused to let a golfer launch a terrific shot toward the green. As we crossed the fairway toward the trail and the confluence, we were puzzled to find the golfer slashing his way through the thick underbrush below us. The underbrush was clearly not where his golf ball had landed. We came to the conclusion that it must have been the confluence that was pulling him inexorably in! The trail downward and toward the west was like a different world from the sunny golf course above--shady and left largely in its natural condition. After a short stroll toward the west down the hiking trail, we took a side path to the left toward the top of a small rise. One found it difficult to imagine that the Pacific Ocean lay only 5 kilometers to the south. As noted by previous visitors, the heavy tree canopy made locating the exact confluence difficult. Therefore, our confluence dance began at the top of the small rise, down a nearly vertical cliff covered with tangled vines and prickly thistles, across the original trail, and below towards California redwood trees. The confluence lies just off of the trail, most likely to the north, but again, because of the heavy tree cover, we could not be certain as to which side. The confluence lies on this north-facing slope of approximately 45 degrees, completely covered with low vegetation, vines, fallen stumps, chaparral, oaks, junipers, eucalyptus trees, and redwoods. After the number of confluences I had visited that were covered by two or three plant species, the variety of vegetation here was truly amazing. We saw numerous birds but no animals. A few mountain bicyclists and hikers passed us. Could they fathom the importance of this trail? After spending about 20 minutes at the site filming, trying to zero out the GPS unit, and photographing the site, we climbed back to the golf course and the bright sunshine. I reflected that this was the second confluence I had visited on a golf course; the first one was in New Jersey at 40 North, 75 West. Surely there cannot be too many confluences on golf courses. After reaching the vehicle, we, from landlocked Colorado, felt drawn to the Santa Cruz beach. After a short beach stroll and meeting one of the interesting local folks, we drove back north to the USGS office, arriving at 8pm after a round trip of 160 kilometers. We now felt ready to teach the GIS course! #1: Confluence site in the Coast Range of California, 5 km from the Pacific Ocean, looking north. #2: David Litke, left, and Joseph Kerski at the confluence site. 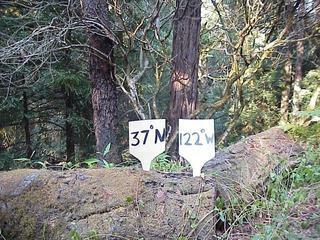 #3: GPS receiver at the confluence; the heavy tree canopy made zeroing out the receiver difficult. #4: View to the southwest from the confluence. #5: View to the west, taken 7 meters west of the confluence. #7: View to the east from the confluence, showing the trail. #8: Tenth fairway of DeLaveaga Golf Course; the confluence lies to the left of the fairway. #9: 360-degree panoramic movie filmed at the confluence site.